Winter is fast approaching, and it promises to be a cold one. If you live anywhere but the Southeast or Southern California, you have months of snow and ice to look forward to in the coming months. Unless you have the luxury of being a snow bird and heading south for the winter, you need to start making preparations now. Life doesn’t stop in the winter, more’s the pity; you have to get to and from work, to and from the grocery store, the doctor, the school – you get the picture. Driving in cities accustomed to this type of weather is not so bad, once the first storm of the year is over, but you need to be able to drive on snow and ice, and this means snow tire chains for your car. You need chains appropriate for your size tires, and you need to consider the ease of installation – you may not be with your wife when that first storm hits, so she needs to know how to get the chains on the tires as well as you. You should also consider whether or not to leave the chains on the tires for the entire winter. Some chains have serious spikes; these will damage the roads if the ice and snow has melted, so ease of installation becomes important. So, start researching snow tire chains now, before the need becomes acute. Look into the various styles of chains, determine how long they’ll need to be on the car, check out the ease of installation and removal, and figure out how much you can afford to spend. These economical tire chains are constructed from stainless steel. Extremely durable, they install and remove easily in snow and/or ice. Low weight makes them easy to handle, and they require low operating space around the drive tires. These chains give a smooth ride, and give the driver smooth starts and stops, as well as improved cornering. You will require two sets of two chains if you drive an all-wheel drive car. This offering from Security Chain is designed for SUVs, passenger cars and pickup trucks with very limited clearance around the drive tires. These chains are go on fast, and as a bonus, have a designed-in rubber tightener. This means once they’re installed, you don’t have to drive a little, stop, get out, and re-tighten the chains – the chains take care of it for you. These chains have higher compatibility levels with the electronics found in newer cars – all-wheel drive, anti-lock brakes, traction control, and other features. There is greater traction performance with these chains versus other conventional tire chains. These chains fit tires sized from 215 to 285 millimeters. A third offering from Security Chain, These chains install and remove fast and easy, and have an extra feature – a designed-in rubber tightener. Without this extra, you have to drive a little, stop, get out, and re-tighten the chains; this bonus takes care of it for you. These chains are made for vehicles with all-wheel drive, anti-lock brakes, traction control, and other features. You get more grip on the ice and snow with these chains, as compared to conventional tire chains. These chains fit tires sized 6.5-16LT up to 265 millimeters. 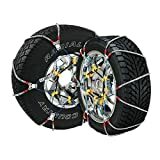 A fourth offering from Security Chain, these tire chains are designed for vehicles with very small clearance around the drive tires. Installing easily. these chains have a designed-in rubber tightener; this feature re-tightens the chains as you drive, so you no longer have to get out and do it yourself. These chains are made for newer cars, with their accompanying electronics – all-wheel drive, anti-lock brakes, traction control, and other features. These chains have more traction than their competitors, keeping you on the road in poor weather conditions. These chains are designed to fit tires sized approximately 31×11.50-15LT up to 325 millimeters. Another offering in the Z6 class from Security Chain; these chains are perfect for cars, SUVs and pickups without much clearance around the drive tires. These chains are easy on, easy off, and they offer an added feature – a designed-in rubber tightener; this feature keeps the chains tight on the tires without you having to drive, get out, tighten the chains, and get back in. Having a higher compatibility level with the electronics found in newer cars, these chains work well with all-wheel drive, anti-lock brakes, traction control, and other features. These chains give you more grip on the snow and ice than other conventional tire chains. This chain is designed to fit tires approximately 9.50-16.5LT up to 265 millimeters. The chains are Zinc plated, and provide two-link spacing for cross chains. A second offering in the Radial Chain line, these tires are a different size from the SC1032 set. These frugal tire chains are stainless steel, making them extremely durable. Easily installed and removed , their light weight makes them handle well, and they require minimal operating space. Easy riding, these chains give the driver smooth starts and stops, as well as improved cornering. The Super Z series has a different design from the Super Z6 series. It is designed primarily for light trucks and SUVs, but it will also fit garden tractors, snow blowers, forklifts, and ATVs. They are designed for roads, however, so do not use on an ATV for off-road trips. These chains meet Class S clearance requirements. Durable, as well as fast and easy to install, they include rubber tighteners. The downside is, you’ll have to stop after driving a while and get out to re-tighten the chains. A second offering in the Super Z series, these chains are a different size from the ZT741 set. Designed differently, this series is made mostly for small SUVs and light trucks; however, it fits small work vehicles as well, such as garden tractors, snow blowers, forklifts, and ATVs. They are not designed for off road applications, however, so do not use for trips to the woods or out in the fields. Fast and easy to install, and they include rubber tighteners. Durable and long-lasting, these chains work well over the long haul. These chains meet Class S clearance requirements. These tire chains from Security Chain are of a different design. All of the other chain sets listed here from Security Chain have been cable chains. This set is a cam style and comes with a cam tool and instructions for easy installation. Primarily for light trucks, these chains are a good choice when clearance is not an issue. They do not meet S.A.E. class S clearance requirements. 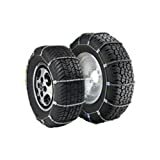 Most of the tire chains in this list are made by Security Chain; Security Chain offers the best selection of tire chains at the best price, so they dominate the choices. Determine your vehicle’s tire size and clearance, and choose the best set to fit your needs. You won’t make a mistake choosing a set of tire chains from this list. And that, as Martha would say, is a good thing!